Photo Caption A: Many of the 120 students inducted into the Berkeley College New York chapter of the National Society of Leadership and Success attend the induction ceremony held at the Brownstone in Paterson, NJ, on August 16, 2017. 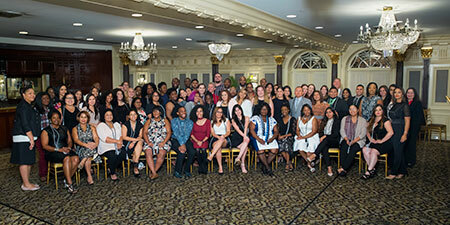 In addition, 91 students were inducted into the Berkeley College New Jersey chapter. Berkeley College celebrated the induction of its third cohort of students into the New York and New Jersey chapters of the National Society of Leadership and Success (NSLS) during a ceremony held at the Brownstone in Paterson, NJ, on August 16, 2017. According to the organization, the NSLS is the nation’s largest leadership honor society. Students are selected by their colleges for membership based on either academic standing or leadership potential. Candidacy is a nationally recognized achievement of honorable distinction. The organization hosts live-streamed speaker events, allowing members to hear from and interact with national leaders, celebrities and best-selling authors such as Arianna Huffington, Carly Fiorina and Rudy Giuliani. During the ceremony, 91 students were inducted into the Berkeley College New Jersey chapter, and 120 students were welcomed into the Berkeley College New York chapter. Four previously inducted members from each chapter were also recognized for receiving National Engaged Leadership Awards from the NSLS. Photo Caption B: Many of the 91 students inducted into the Berkeley College New Jersey chapter of the National Society of Leadership and Success attend the induction ceremony held at the Brownstone in Paterson, NJ, on August 16, 2017. 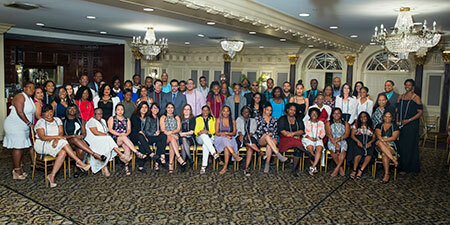 In addition, 120 students were inducted into the Berkeley College New York chapter. The evening also recognized three members of the Berkeley College community who have made significant contributions to the academic success of Berkeley College students. Byron K. Hargrove, PhD, Director, Berkeley College Honors Program, received the Excellence in Teaching Award. Annette Long, Vice President, Central Support Services, Berkeley College, received the Excellence in Service to Students Award. Rachel Jaffee, Assistant General Counsel and Assistant Vice President, Compliance, Berkeley College, received Honorary Membership in the Society. Click here to view more photos from the induction ceremony. 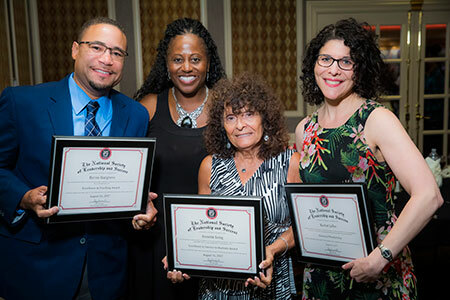 Photo Caption C: Dallas Reed, PhD, Vice President, Student Development and Campus Life (second from left), presents members from the Berkeley College community with honors during the National Society of Leadership and Success induction ceremony held at the Brownstone in Paterson, NJ, on August 16, 2017. Pictured above (L to R) are Byron K. Hargrove, PhD, Director, Berkeley College Honors Program; Annette Long, Vice President, Central Support Services, Berkeley College; and Rachel Jaffee, Assistant General Counsel and Assistant Vice President, Compliance, Berkeley College.